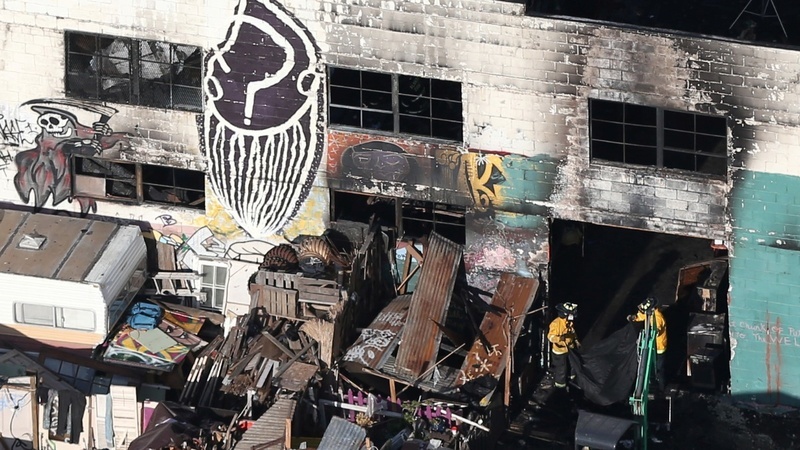 Two people were arrested today on charges related to the Ghost Ship fire that killed 36 people inside a live-work artists' warehouse in Oakland last year. One of the people arrested was the promoter of the underground music performance for which those killed were gathered. Derick Ion Almena, 47, the concert promoter who converted the warehouse into an artists residence and underground concert venue, was arrested Monday morning, according to Alameda County Asst. Dist. Atty. Teresa Drenick. Charges have yet to be formally filed, she said. The second arrestee was identified as Max Harris, Drenick said. The fire at the warehouse known as the Ghost Ship broke out during a Dec. 2 concert, trapping scores of attendees inside. All of the victims died of smoke inhalation, according to coroner’s reports. They ranged in age from 17 to 61.